Los Angeles has over 2000 senior living options. When it becomes overwhelming to provide the care you want for your loved ones, providing them with the opportunity to receive the needed care blesses both your loved ones and you. Luvdid will connect you with the best senior care facilities in Los Angeles. For more, read below. The process of choosing the right place where your loved ones receive the right care and the safety they need can be very challenging. Receiving assistance with the care of our loved ones allows us to provide them with the best care possible. Whether the assistance calls for their day to day activities, bathing, cooking, grooming, etc., now you can get all these services by connecting yourself with Luvdid.com. It is possible to research online the many companies providing services. Not only is this quite time consuming, but you never know just from reading about a place what the quality of that service is like. Luvdid.com provides a one-stop, hassle-free, confidence-producing search engine for you to find just the right care. So here we have solution for you to find best suitable care, Just to make it easy and simple for you, we brought an Senior Independent search Engine for you LUVDID. Click here to redirect to Assisted living for Senior Living in Los Angeles CA. The total number of assisted living facilities continually increases day by day. Because you desire to know that your loved one is safe, cared for, and enjoying the best possible quality of life, choosing the best option becomes paramount. To help you choose a trustworthy, and reliable place we provide a list of facilities. The geographic boundaries of the County of Los Angeles coutny include 88 incorporated cities, each of these cities contributes a rich and unique dimension to the Los Angeles County region. Here are the listings of Assisted living for those most popular Cities in LA. Assisted living Homes For Senior Care in Los Angeles,CA. Assisted living Homes For Senior Care in Long Beach, CA. Assisted living Homes For Senior Care in Glendale, CA. Assisted living Homes For Senior Care in Santa Clarita, CA. Assisted living Homes For Senior Care in Lancaster,CA. Assisted living Homes For Senior Care in Palmdale, CA. Assisted living Homes For Senior Care in Pomona, CA. Assisted living Homes For Senior Care in Torrance, CA. Assisted living Homes For Senior Care in Pasadena, CA. Assisted living Homes For Senior Care in El Monte, CA. Assisted living Homes For Senior Care in Downey, CA. Assisted living Homes For Senior Care in Inglewood, CA. Assisted living Homes For Senior Care in West Covina, CA. Assisted living Homes For Senior Care in Norwalk, CA. Assisted living Homes For Senior Care in Burbank, CA. HOW LUVDID HELPS YOU FIND ASSISTED LIVING FOR ELDERLY ? Fact: Did you know that there are listings over 11000 Assisted Living Facility Homes / Residential Care Homes for the Elderly Care Services in California alone. Luvdid is a Best Country wide Search engine to find Best Assisted living Facilities in United states, It has listings over 30,000 Assisted Living Facility Homes / Residential Care Homes all over USA. We have listings covered from all over Major states in United states. 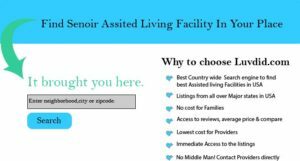 Shows: Search, Sort, Compare Assisted Living of your choice. Here is the best advantage of choosing Luvdid is below. You will get an expert assistance in everything that you need to accomplish. They will take care of your hygiene needs. Take care of your prescribed drugs. Take you from one place to other. Assist you in preparing social activities or outings. Set different indoor and outdoor activities for you like gardening, games, etc. You may see many different Assisted living Facilities which claim to provide the best services but choosing the best one for yourself or for your loved ones can difficult to decide. Just to make your choice simple, here we have a list of top care homes which provides the best-assisted services. Click here to Search Best Assisted living facilities Homes In Los Angeles,CA. Cost Of Assisted living In Los Angeles ? The Cost of Assisted living varies wildly depending on the neighborhood. Monthly costs for a private, one-bedroom unit range from as little as $1,500 or as much as $7,000. The median cost for such a unit is $3,500. * A senior should plan on spending a minimum of $42,000 per year for assisted living in Los Angeles. Rules and Regulations of Assisted living In Los Angeles ? Assisted Living communities, licensed as Residential Care Facilities for the Elderly (RCFEs) in California, are highly regulated with a robust body of laws and regulations designed to promote resident independence and self-direction to the greatest extent possible in a residential, nonmedical setting. The California Department of Social Services, Community Care Licensing Division (CCLD)enforces these laws and regulations through the initial licensing process and periodic inspections. RCFEs are regulated by the California Code of Regulations Title 22 , Division 6, Chapter 8. In addition, the RCFE Act establishes additional statutory requirements in many of the same areas as Title 22, and the Evaluator Manual is used for the application and enforcement of laws, policies, and procedures. There are also new laws which are not yet reflected in the regulations. Although the state has fallen behind in updating the regulations to reflect these new laws, the statutory requirements are in effect and being enforced throughout the state. Well, if we talk about the demand then it is quite high nowadays. The city is beautiful to live and the total population of Los Angeles is near about 3.976 million. And almost every third elder person living in California are connecting with themselves with these services and enjoying their beautiful life. Many people are choosing this high demand as their career opportunities. So, if you are also looking for the best elderly care home which can provide good services to you or your loved ones then we suggest you choose us. Luvdid provides the best facilities to elder people.